If you have problems with your Revit Filled Region hatch patterns displaying grayscale when they should be black, its probably because Revit thinks that the lines are too close together for the scale of view that you are using. What Revit wants is for you to increase the scale or spacing between the individual lines of the Filled Region pattern – then it will switch back to black, as it should be. Using a Model pattern, I was able to observe the pattern go from light gray to black as I changed the scale (spacing) between the lines. Make a Drafting View in Revit with a couple of Filled Regions in it. Set the filled Regions to the Revit Hatch Patterns that you want to export to PAT files. 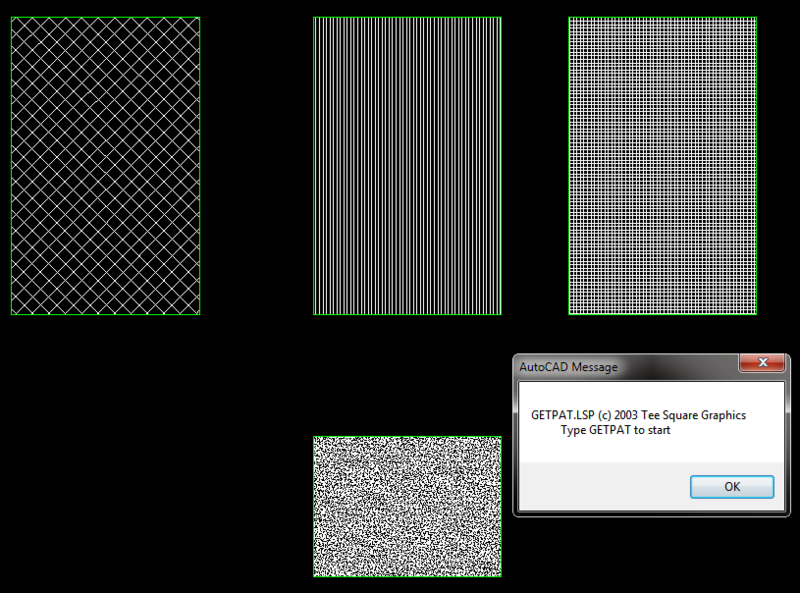 In AutoCAD, APPLOAD then browse to getpat.lsp file. To get this file, right-click and Save Target as from this link. Select the hatch you want to export. It *should* be saved as a PAT file to the same directory that the DWG file is in. Do you love or hate Revit Fill Patterns? Here is a collection of some tips and tricks related to Fill Patterns, or ‘hatching’ in AutocadSpeak. If you want to load some of these patterns into your project, use the normal procedure (Fill Patterns – New – Custom -Import). 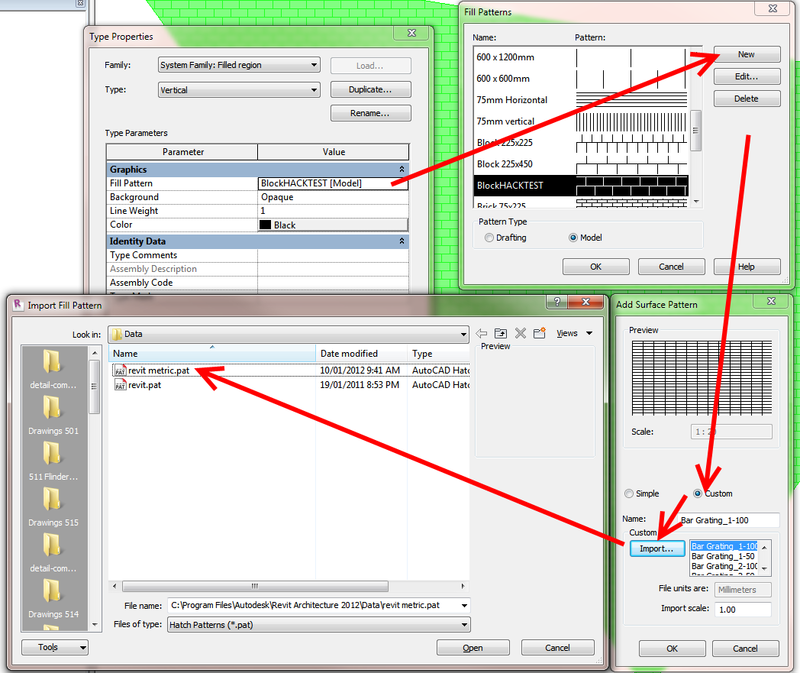 Copy the location of the PAT files from your navigation bar in Windows 7 into the dialog and hit Enter. Click on one of the files and you can select one of the patterns to load. Once a pattern is imported, it is stored in the project, independent of the original file. 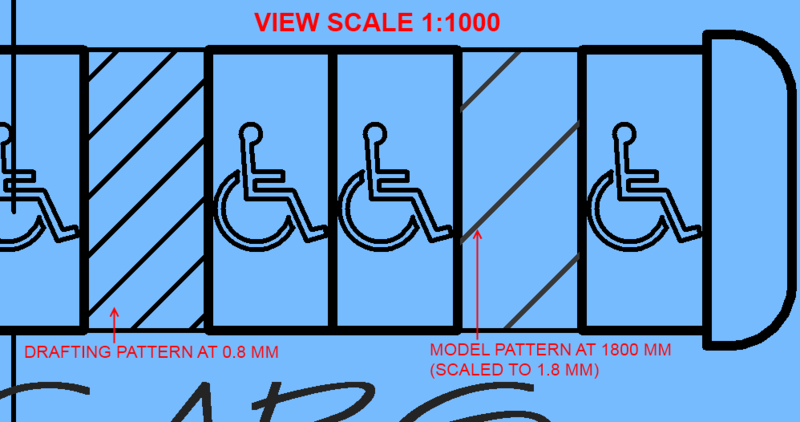 Drafting patterns are defined in paper units. 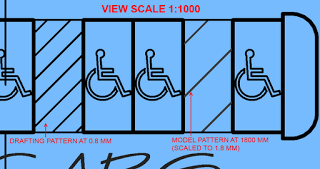 If you import the pattern at scale 1 and print at 100% zoom, the pattern’s dimensions on paper will be exactly as specified in the file, regardless of view scale. Default Revit fill patterns are stored in the revit.pat and revit metric.pat files in the Revit program group Data directory. The revit metric.pat file contains various metric masonry and iso patterns. AutoCAD has an 80-character line size limit, Revit’s is 4096. AutoCAD allows arbitrary sequences of dashes, spaces and dots, Revit coerces them into dash-space format by inserting zero spaces and dashes. AutoCAD has a notion of dots, Revit expands them (including the zero dashes it inserted) into short dashes. AutoCAD has a maximum of 6 components to a line pattern, Revit has no limit. AutoCAD does not allow spaces in a pattern name, Revit does. AutoCAD allows only one pattern per a custom file, with pattern name matching file name, and with the file residing in a known location. Revit has none of these restrictions. AutoCAD and Revit utilize different logic to decide whether a pattern is acceptable. 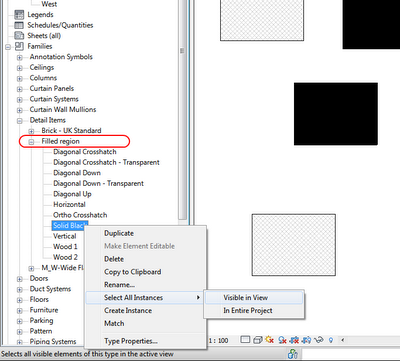 I previously reposted a method on how to bring AutoCAD hatches into Revit with correct scaling. Did you know that the Project Browser Families node provides access to more than just traditional component families?